Tours run from 9.30am – 4.30pm April – October and from 10am – 4pm November – March. Built in 1871 in memorial to Queen Victoria’s beloved Prince Albert, The Royal Albert Hall is one of the world’s most iconic and beautiful venues. Get a unique insight into its history, architecture and reputation as a world-class venue with this insightful tour led by a friendly and knowledgeable guide. Visit the stunning auditorium, take in the breathtaking views from the gallery and even gain exclusive access to the Royal Retiring Room – a place for the royals themselves to relax before, after or in the middle of a performance. 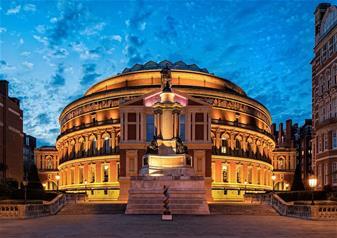 The stage at the Royal Albert Hall has played host to an unbelievable range of performers and speakers, including Winston Churchill, Frank Sinatra, Wagner, Beyonce and The Beatles; it is a venue immersed in a rich and exciting history. The Grade I listed building is as interesting as it is beautiful and as you take this special one hour tour, you may even be lucky enough to see artists rehearsing for the evening’s performance! Children under 5 years are not permitted between July 14 and September 9 2017.